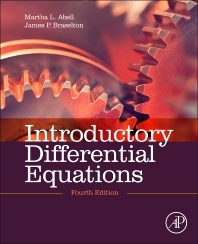 Introductory Differential Equations, Fourth Edition, offers both narrative explanations and robust sample problems for a first semester course in introductory ordinary differential equations (including Laplace transforms) and a second course in Fourier series and boundary value problems. The book provides the foundations to assist students in learning not only how to read and understand differential equations, but also how to read technical material in more advanced texts as they progress through their studies. This text is for courses that are typically called (Introductory) Differential Equations, (Introductory) Partial Differential Equations, Applied Mathematics, and Fourier Series. It follows a traditional approach and includes ancillaries like Differential Equations with Mathematica and/or Differential Equations with Maple. Because many students need a lot of pencil-and-paper practice to master the essential concepts, the exercise sets are particularly comprehensive with a wide array of exercises ranging from straightforward to challenging. There are also new applications and extended projects made relevant to everyday life through the use of examples in a broad range of contexts. This book will be of interest to undergraduates in math, biology, chemistry, economics, environmental sciences, physics, computer science and engineering. Provides the foundations to assist students in learning how to read and understand the subject, but also helps students in learning how to read technical material in more advanced texts as they progress through their studies. Exercise sets are particularly comprehensive with a wide range of exercises ranging from straightforward to challenging. Includes new applications and extended projects made relevant to "everyday life" through the use of examples in a broad range of contexts. Accessible approach with applied examples and will be good for non-math students, as well as for undergrad classes. Martha L. Abell and James P. Braselton are graduates of the Georgia Institute of Technology and the Ohio State University, respectively, and teach at Georgia Southern University, Statesboro where they have extensive experience in Mathematica-assisted instruction at both the undergraduate and graduate levels. In addition, they have given numerous presentations on Mathematica, throughout the United States and abroad. Other books by the authors include Differential Equations with Mathematica, Second Edition and Statistics with Mathematica.